Hello, friends! 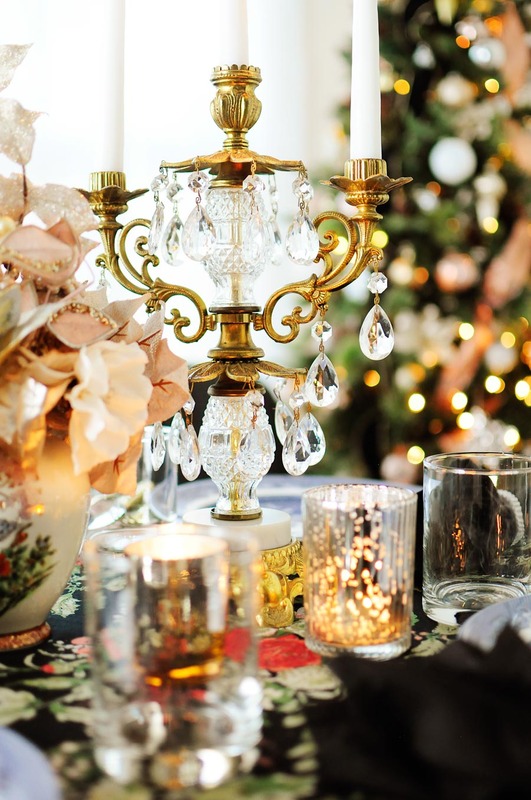 Welcome to the Cozy at Christmas blog tour. 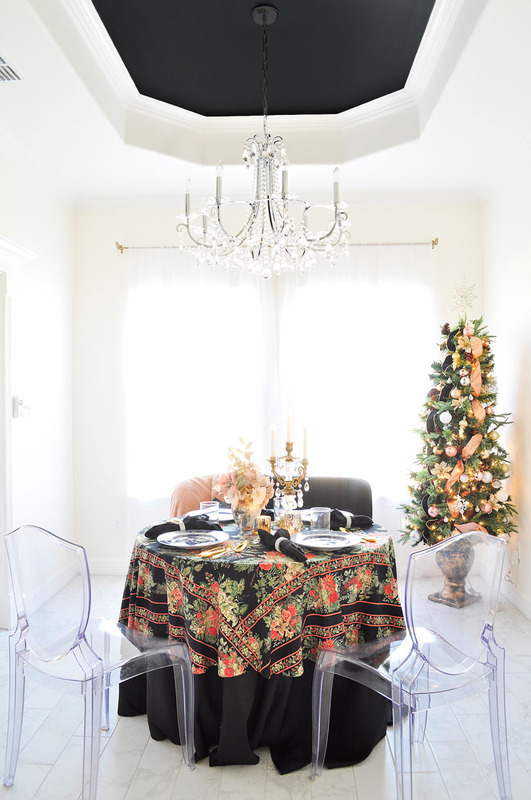 Our small dining room space is definitely cozy…but it’s also stylish and decorated for the Christmas holiday season. You can view my Christmas Tree Tour here and my full holiday house tour here. We’ve lived in our new home since the end of September, and when building it we didn’t leave a ton of room for a dining room like we had in our former home. 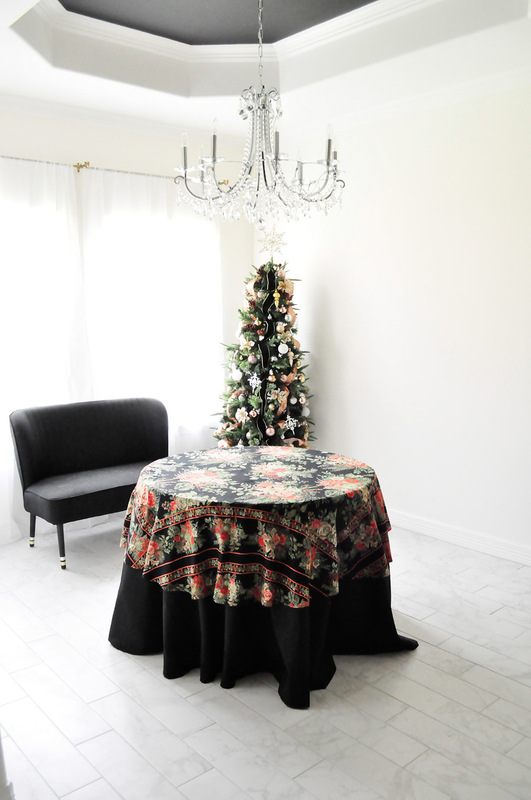 Our dining space is small at about 10×12 feet or so, but I put a huge crystal chandelier in the middle of a black tray ceiling to really make the space feel grand and cozy. I know that’s a weird juxtaposition, but just go with it, ok? 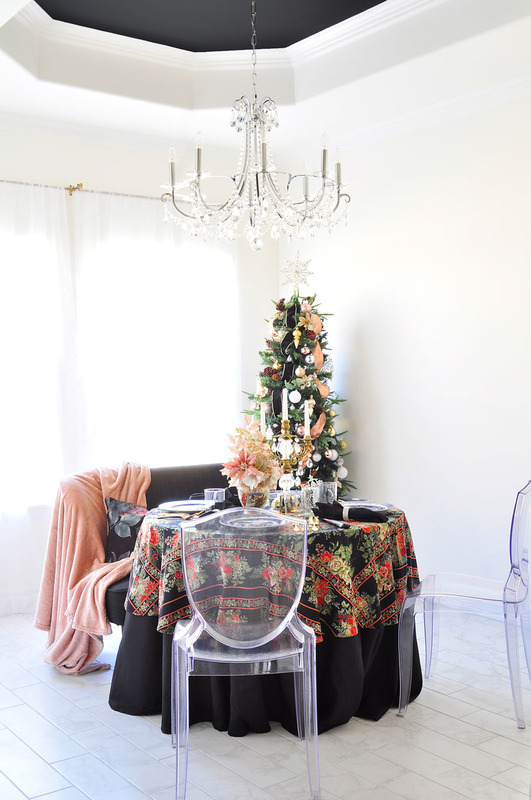 I’m going to take you through how I transformed my small dining space for the holidays. 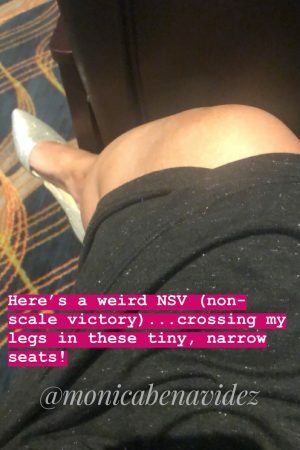 So no matter your size of space, I hope you can find some nuggets of inspiration in this post. 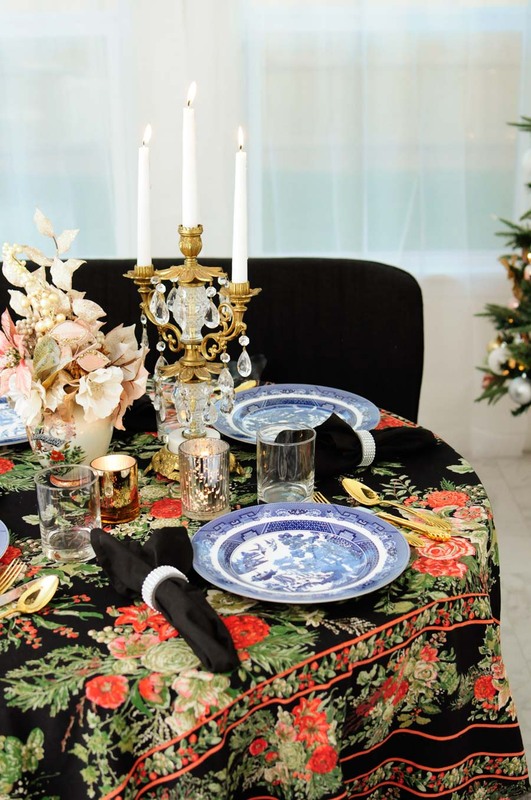 I started with my round white dining table covered with a 108″ black tablecloth and topped with a 70″ floral tablecloth , two lucite ghost chairs , and a small black bench from HomeGoods. My 6.5′ potted Christmas tree is in the back. 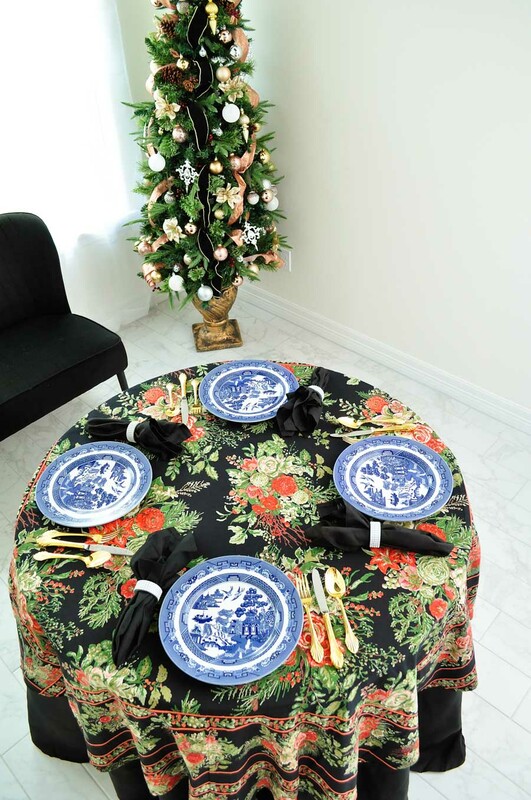 I steamed the creases out of my tablecloths so that they lay beautifully on the table. Now it’s time to put the things that should absolutely be on a dining table- plates, silverware and all those practical sorts of things. 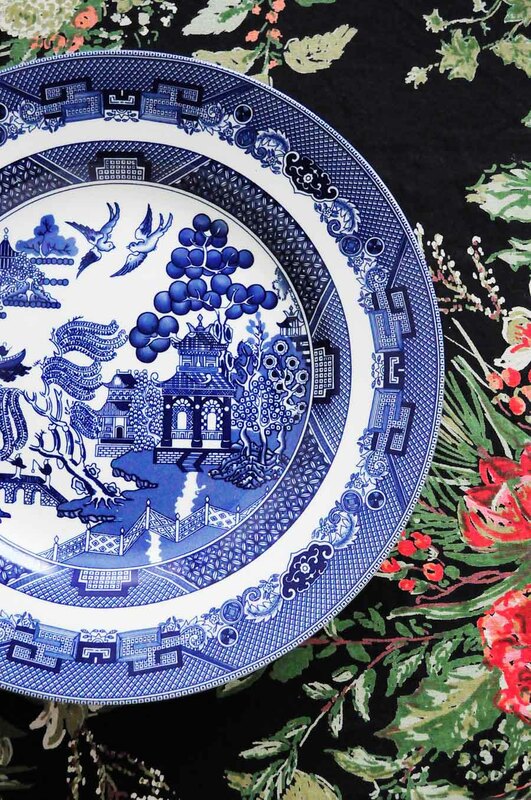 I picked up these stunning chinoiserie blue and white dinner plates online awhile back, and I was so sad I was only able to find four. Since then I’ve learned this is a popular pattern that is pretty easy to find online. It is gorgeous and so timeless. Also highly collectible if you find some vintage ones. 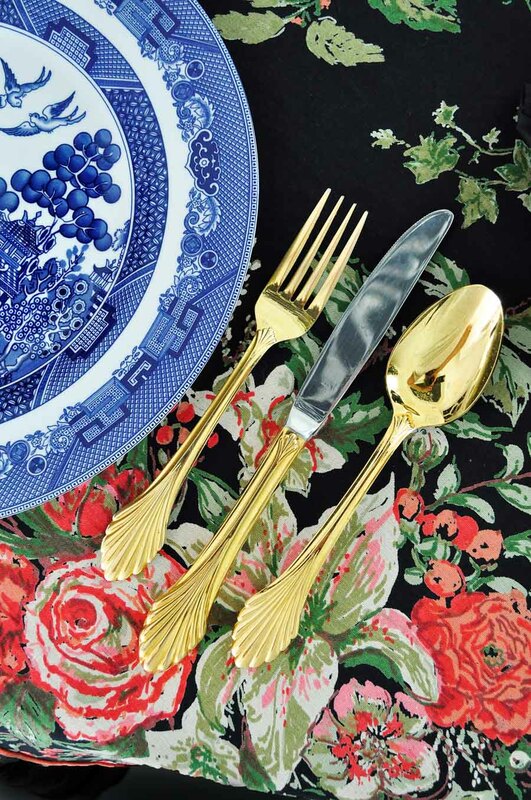 I then paired it with some vintage gold silverware I found during my antique travels in Marble Falls last year. 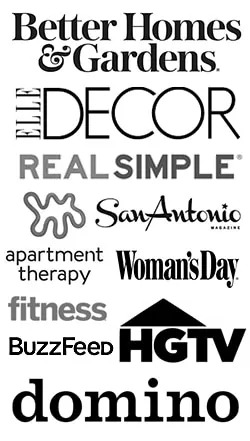 If you haven’t been to Marble Falls, Texas, you MUST GO. I love it so much. For the glassware, I used some short juice glasses that would be perfectly fine for water, wine spritzers, sweet tea, or soda. Sometimes practical is good, you know? Up next I added in a small Asian/chinoiserie inspired vase (another Marble Fall find from a local thrift store), some faux flowers and one of my brass, marble and crystals candlesticks (the other one is on my super affordable round gold coffee table ). I finished it off by adding a few votive candles for extra warmth and sparkle. I know this whole set-up is quite eclectic, but yet it all works together. I’m a fan of using decor you love. 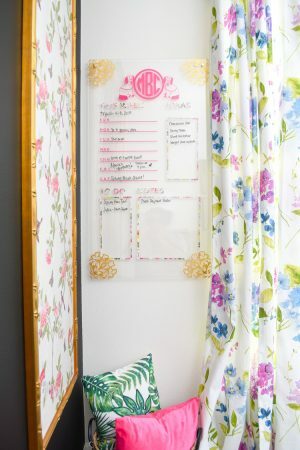 Who says small can’t be glamorous? I love the view from the living room- the whole area is warm and cozy. Perfect for small dinners with friends or family. 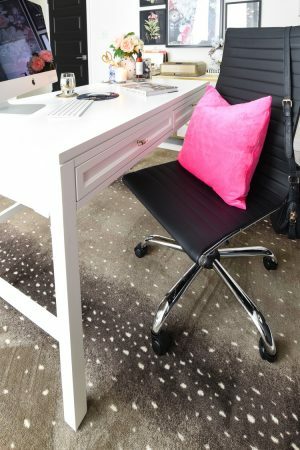 The floral velvet pillow and blush pink throw add some luxe texture. Since last year, we’ve made a lot of progress in this dining space, starting with a budget botanical dining room makeover (we only spent $100) and then adding emerald green velvet curtains. 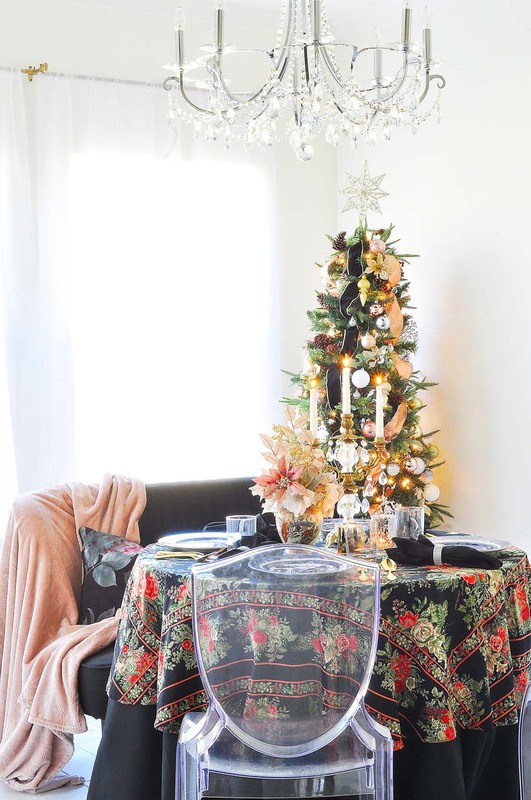 No matter the size of your space, you can definitely make it cozy and glam for the holidays! And it is SNOWING here in South Texas, so with that I’m off to make a cup of coffee and stare at the gorgeous white fluffy stuff blanketing my home. 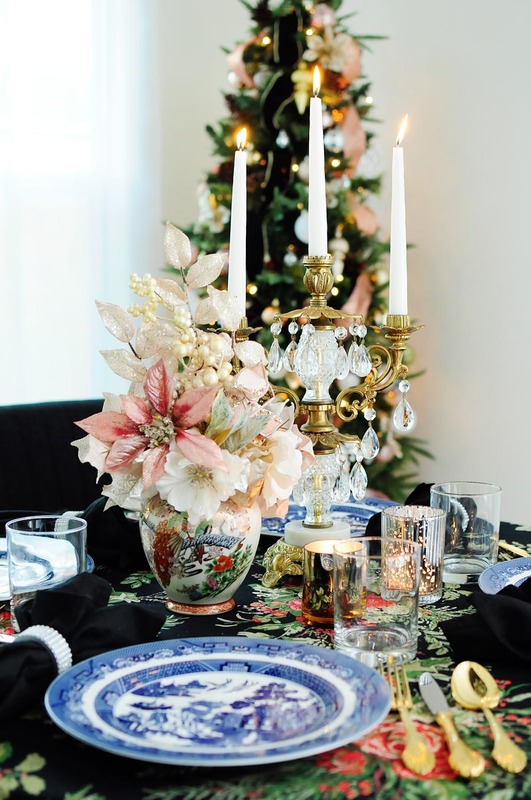 I love your style.My style is whimsical at Christmas, but my sister's is gorgeously formal and elegant like yours.Hoping you are having a very Merry Christmas. Well goodness, gracious this is totally awesome, stunning and beautiful! Love these gorgeous colors and the beautiful light! 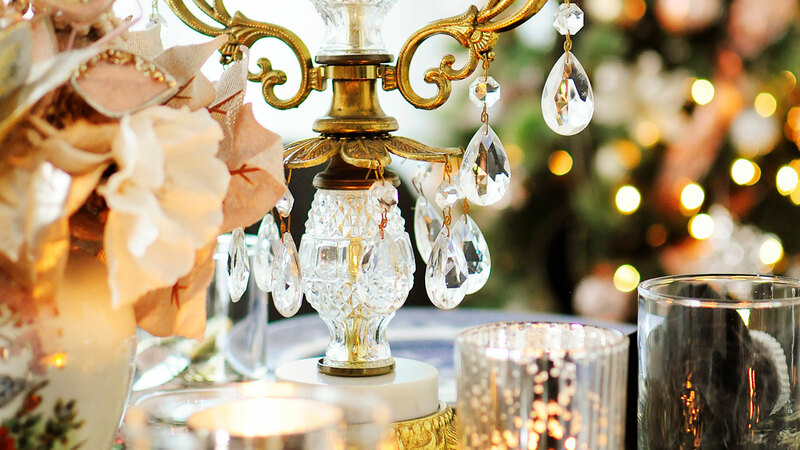 Love how you transformed your dining area into such a glamorous spot. Stunning. Oh my heart is swooning with delight. 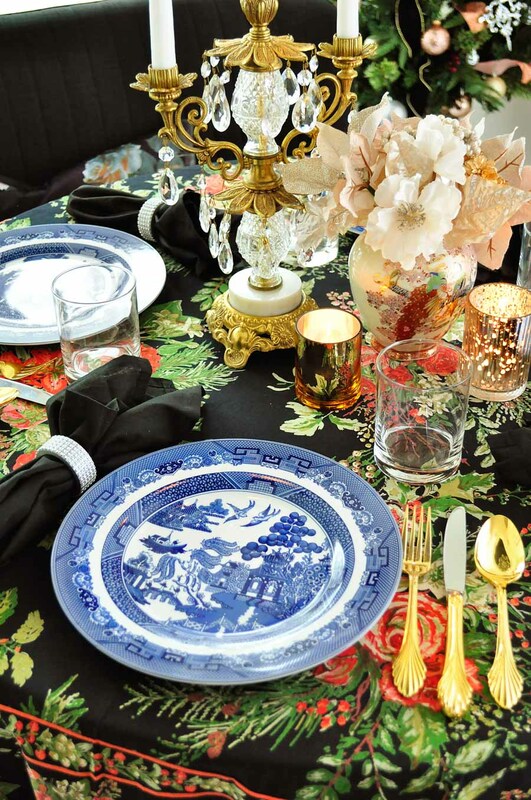 I adore that black floral tablecloth! The entire vignette is enchanting. Looks so elegant and sophisticated! Beautiful job on the table and that tree is phenomenal. Thank you for sharing. Merry Christmas! This is stunning and so unique. I love, love the blue with all the black. Fabulous. Thanks so much for being a stop on our tour.